We all know that Dutch league soccer is dominated by Ajax, PSV and sometimes Feyenoord. Those three clubs have won 95% of all league titles since 1960, only two other clubs (AZ twice and FC Twente once) also managed to win the championship. From 1946 until 1959, it was the other way around. Fourteen championships were contested, and twelve different clubs won. Willem II from Tilburg and Ajax from Amsterdam both won two titles. Perhaps the most surprising title during this period is the one Limburgia claimed, back in 1949-50. 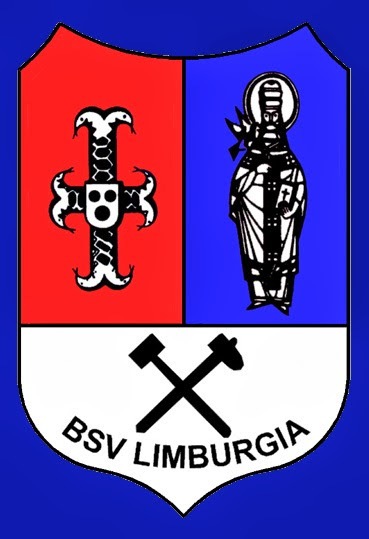 Limburgia was the soccer club of Brunssum, a small town in the southern province of the Netherlands, Limburg, where the National Mine ‘Hendrik’ provided for most of the work. Nearly all their players were working in that coal mine. Limburgia was founded in 1920 as Rhenania. Seven years later, the name was changed into Sportvereniging Staatsmijn Hendrik (Sportsclub National Mine Hendrik), and in 1936 into Limburgia. In those days the first level in the Netherlands consisted of four, five or even six regional leagues. Yearly the winners of those leagues played each other home and away, to determine the national champion. 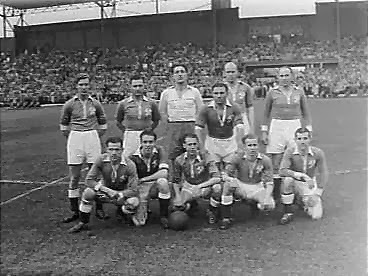 Limburgia first played on the highest level in 1939, and won their southern region league for the first time in 1945-1946. During those play-offs, Limburgia managed only three wins, and came in last with six points from ten matches. HFC Haarlem was crowned champion that year. - East I: Enschedese Boys, seven point ahead of Heracles from Almelo. - South II: Maurits (Geleen) , three point ahead of BVV from Den Bosch. - West II: Ajax (Amsterdam), two points ahead of De Volewijkers, also from Amsterdam. The region South I was the most exciting that year. After 18 matches, both PSV and Limburgia had 25 points, so a play-off match had to be played, in Venlo. The odds were slightly in favor of Limburgia, as they had beaten PSV twice 2-1 during the regular season. In a very exciting match history repeated itself, as Limburgia also won this third match 2-1. 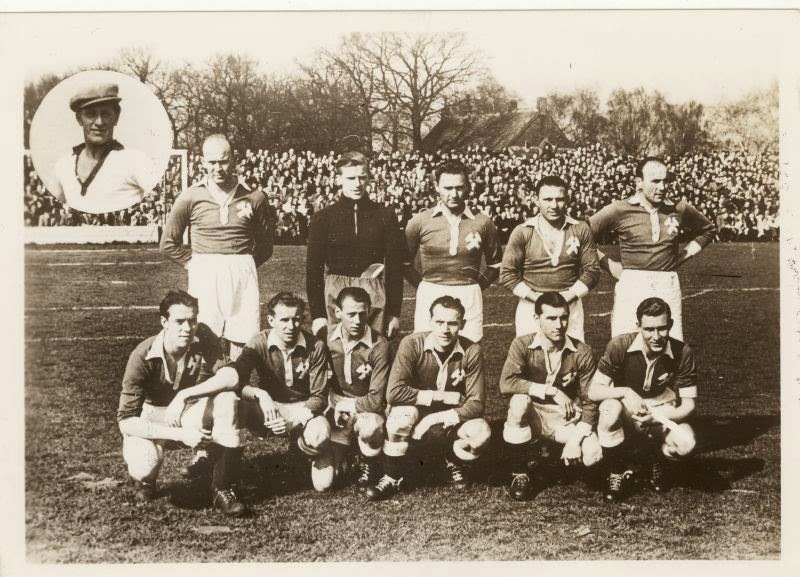 Piet Bruins and Frits de Graaf scored for Limburgia, only Harry van Elderen got on the scoresheet for PSV. Limburgia played as one would expect from mineworkers; enthousiastic, tough and powerful. PSV had the better players, the better technique and were tactically superior to Limburgia. But still, they lost. Nobody really expected Limburgia to do well during the Champions Round. Ajax and Heerenveen (with the best Dutch players of these years, Abe Lenstra) were the big favorites. But Limburgia had a flying start, with a 4-3 win at home against Maurits. Oddly enough, Maurits was a team from neighboring town Geleen, with most of his players also being mineworkers – from another National Mine, Prins Maurits. One can imagine that this was a very rough match. After a 3-3 draw in Amsterdam against Blauw Wit, a 2-1 defeat against Maurits and a 4-1 victory over Enschedese Boys, Limburgia and three other clubs (Heerenveen, Maurits and Blauw Wit) all had five points. Ajax had four and Enschedese Boys just one. It was totally unclear where this was going. Limburgia still had to play both Heerenveen and Ajax twice, so their chances were considered slim. But somehow they got on a roll. Especially the forwards, Frits Cox and his brother Lei Cox, Frits de Graaf, Piet Bruist and Nelis van Lübeck started banging in the goals. And defensively, Sjra Jacobs, the finest goalkeeper ever to come from the province of Limburg, delivered some spectacular performances. He missed the first matches through sickness, and was guilty of three mistakes during the 3-3 against Blauw Wit. But now he was making his mark, denying great forwards as Rinus Michels (Ajax), Piet Koekebakker (Blauw Wit) and Abe Lenstra (Heerenveen). Sadly, a few years later, while playing for Rapid JC, Jacobs received a kick to the head in a match against PSV. As medical attention was slow, it caused major brain damage which ended his career – and ruined the rest of his life. 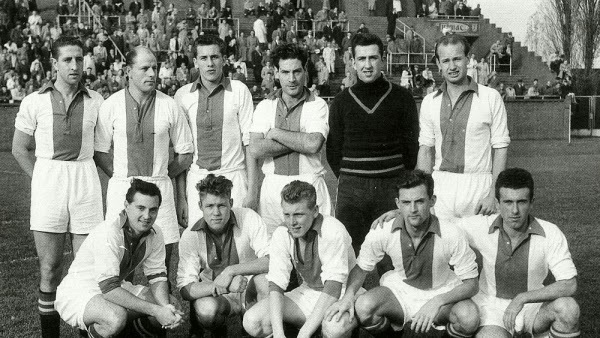 Back to 1950: Limburgia won those matches, four in a row, while scoring lots of goals. A 6-2 victory at home against Blauw Wit (according to the newspapers Blauw Wit were the better team that afternoon!) put Limburgia three points ahead of them, with just two matches to go. So now, Limburgia were suddenly on top and needed just one more victory. The first attempt failed, as Limburgia lost 3-5 in Heerenveen to Abe Lenstra and his boys. Now it became necessary to win their final match, away to Ajax. This match was played in a sold out Olympic Stadium. Two thousand Limburgia-supporters travelled with their team to Amsterdam, hoping to witness a historical moment. Ajax had little to play for: a victory against Limburgia would mean they would finish third. If not, they would come in fourth. Either way, a big disappointment. Most likely, their eyes were on their rivals from Amsterdam, Blauw Wit. If Ajax should win against Limburgia, Blauw Wit probably was the new champion. The game started with Ajax mostly in possession, trying to score the first goal. They failed, not only because they were not determined enough, but mainly because goalkeeper Jacobs simply was unbeatable. After thirteen minutes Limburgia suddenly took the lead, Frits Cox making an easy goal. Two minutes later, Limburgia’s best player, Frits de Graaf, made it 0-2. After that, Limburgia were in control. They were no longer intimitedated by the skills of their opponents, their confidence rose as the game progressed. During the second half Ajax were completely outplayed – only midfielder Joop Stoffelen kept his ground. On the other hand, defender Cor van der Hart - a player with a big reputation - had one of the worst matches of his life. Limburgia wasn’t satisfied with 2-0 and goals by De Graaf, Lei Cox (two) and Cobben made it 0-6. After the final whistle, not only the Limburgia-supporters were in seventh heaven. Most of the 50,000 spectators at the Olympic stadium cheered for them – at the same time knowing that Blauw Wit was beaten for the title. Limburgia was crowned champion of the Netherland. That was a first, as no other club from the province Limburg had accomplished such a feat before. These were the players of that legendary team: Sjra Jacobs, Jan van Huizen, Willy Groen, Hens van Lübeck, Hub Welzen, Mathieu Spanjer, Piet Bruist, Frits Cox, Lei Cox, Frits de Graaf and Nelis van Lübeck. Also reserve-goalie Jonker and the attackers Jan Eggels en Lei Cobben were involved. Overall Limburgia had a decent team, but not a great one. They had played together for years, which obviously strengthens a team. 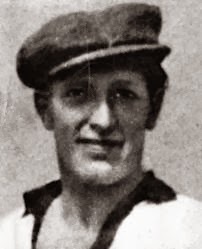 Just one player, right winger Frits de Graaf, made such an impact that he was picked for the national team four months later. De Graaf was extremely fast and had a thundering shot. He collected three caps, against Switserland, Belgium and France in late 1950, losing all three of them (5-7, 2-7 and 2-5). Still, he managed to score two goals. Or even three, as De Graaf has always claimed an own goal by Swiss player Roger Bocquet to be his. After 1950, Limburgia slowly disappeared from the scene. A third place in the regional league in 1951 was followed by a fith place a year later, and a seventh place in 1953. 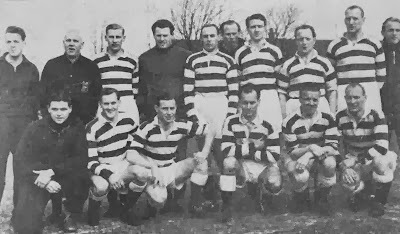 After the introduction of professional soccer in the Netherlands in 1954, Limburgia didn't make the cut for the start of the 'Eredivisie', and had to play in the second division. In 1963 they dropped another level, until the club decided to leave professional soccer and went back to being an amateur club in 1971.